The following circuit comprises of NodeMCU (ESP8266) which is intended to run a 200 RPM johnson motor. The circuit comprises of 5V Relay connected via Darlington pair using transistors. 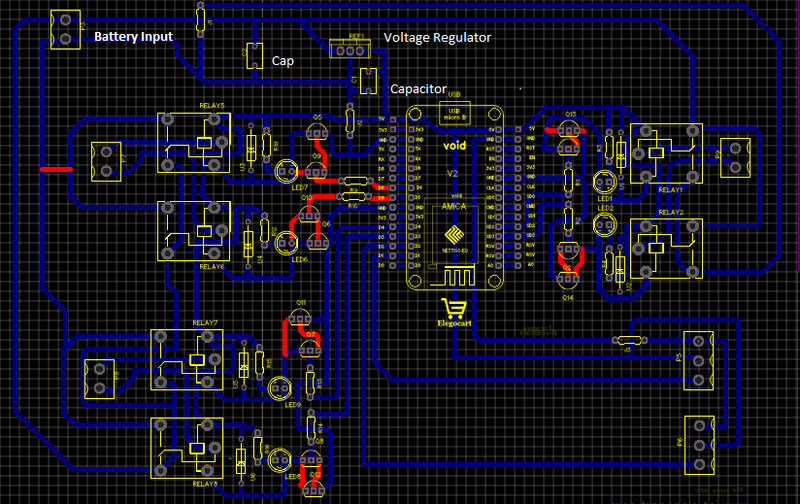 The circuit is powered by 12V, 1.3A battery through a 7805 Voltage Regulator. The circuit runs the motor for few seconds and then turns OFF abruptly. Please let me know if there is an error in the circuit or any power circuit need to be additional put. Browse other questions tagged power-supply motor relay esp8266 nodemcu or ask your own question. Serial diode to universal motor and brush lenghts differs on intermittent run, why? Wemos R1 D1 or NodeMCU + motor?